« Don’t Miss the Chincoteague Shore Craft Beer Festival! Chincoteague Island’s Captain Timothy Hill House, built circa 1800, was abandoned in 1954, its past forgotten, and was almost torn down – but happy fate intervened. 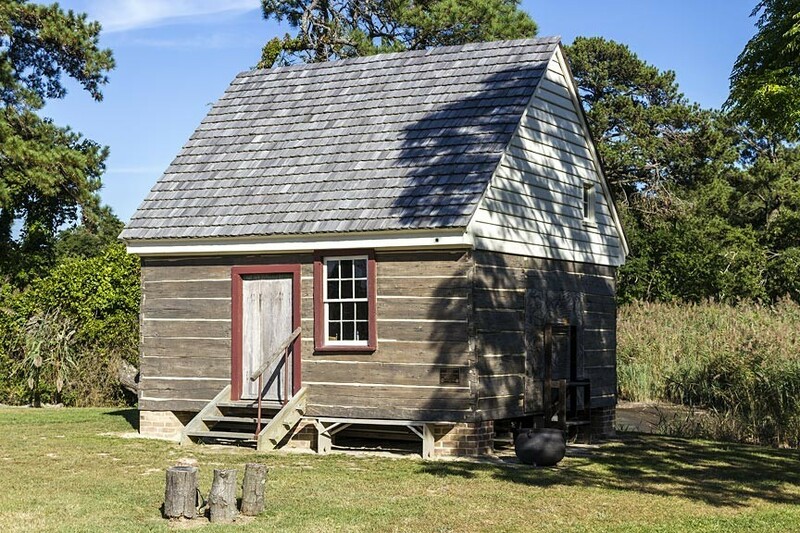 Come discover the oldest house on Chincoteague Island – The Captain Timothy Hill House! The Captain Timothy Hill House was long thought to be just an old eyesore. The dilapidated, one room structure sat on Chincoteague’s historic Main Street beneath vines and a facade of rotting weatherboard. A local couple decided the old building, properly cleaned up and moved once again, would make a good bicycle shed. Little did they realize what they were getting into. Closer inspection revealed dovetailed log plank construction and other interior details that aroused suspicion. Most curious were the depictions of early sailing ships carved into its exterior walls. Could this old shack have greater significance? As it turned out, their proposed “shed” was the oldest building on Chincoteague Island! Its construction mirrored that of the kind the earliest European settlers brought with them in the 1600’s. It even had a wooden chimney – one of only two buildings still standing in Virginia with such a feature! Investigations eventually revealed the building to be the house of Captain Timothy Hill, built circa 1800, when the island was transforming from pastureland to homes and farms. The Captain Timothy Hill House was successfully moved to its new location and has been fully restored. Today, it serves as a museum of Chincoteague’s early years. History buffs and those who love Chincoteague will definitely want to visit! Visit the Captain Timothy Hill House website for more pictures and information. Interested in historic Chincoteague homes? Why not stay in one during your Chincoteague getaway? Miss Molly’s Inn Bed & Breakfast is a historic Chincoteague Island B&B offering supremely comfortable rooms, daily gourmet breakfasts, beach gear, and more! Book your stay today!